The need: The Grains Research and Development Corporation makes a significant investment in building its leadership capacity by sponsoring leadership training and scholarships. 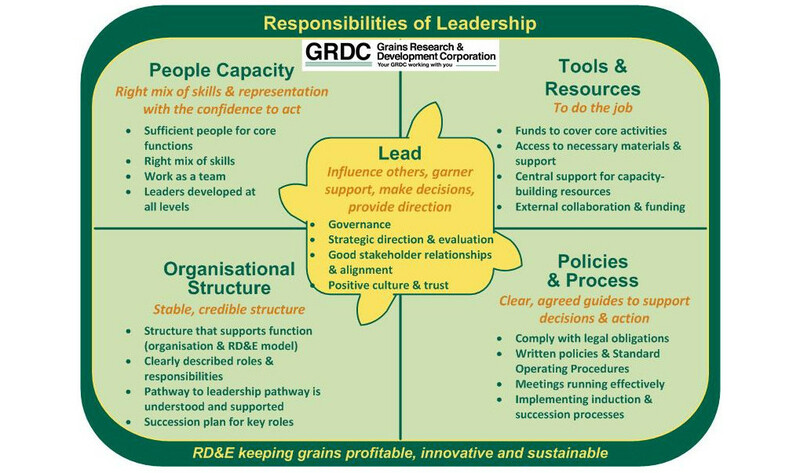 In 2015 the GRDC Capacity Building team wanted to ensure RD&E had the leadership it needs and that the industry’s investment was being effective. What we did: The Harris Park Group conducted an in-depth assessment of grower and adviser leadership in the grains industry to inform discussions about building leadership capacity. This was a highly stimulating exercise as many of the concepts and ideas grew from hearing about leadership in RD&E from ‘the ground up’. Outputs from this work included mapping all of the leadership roles across Australia, categorizing the skills required by grower leaders as ‘Starting’, ‘Strengthening’ or ‘Mastering’, and producing a Resource Directory of existing training opportunities for the grains industry.